You are viewing Badge-Lanyards.com - A1 Lanyards and Badge Holder ID Lanyard Supplies. We are manufacturer and supplier of lanyards, badge holders, ID cards, retractable badge reels and badge clips for school, business or trade show name badges with factory direct wholesale cost to general publics. We supplies custom selections of ID card name badge holders, badge clips (bulldog or alligator clips), keyrings (split-rings, key chains ), swivel hooks, safety breakaway, or custom logo imprinted for neck lanyards or wrist lanyard applications. Miscellaneous Pre-Made Lanyards and Ready to Go Lanyard Series. Badge Holders For ID Cards, Plastic Name Badges, Magnetic Name Tags or Ticket Holder Supplies. Ez-Adjustable, Eye-Catching and Pre-Printed Pattern Lanyards For Personal Use, Small Business, Fundraising or Kids Party. 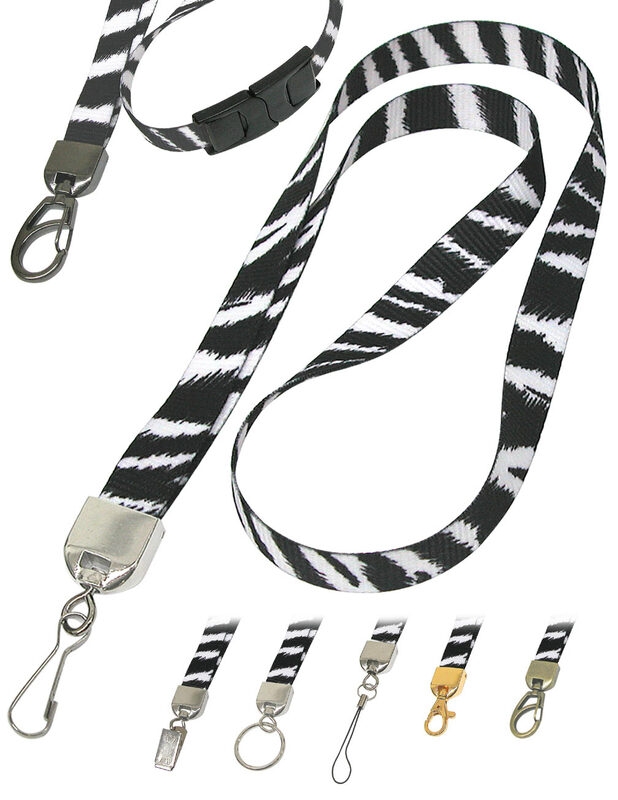 Ez-Adjustable, Animal Print, Funny Novelty, Zoo, Personal or Small Business Lanyards. Only A Small Amount of Money, You Can Buy Yourself A Nice Looking Lanyards For Your Fashion IDs or Name Badges! Ez-Adjustable Double Ends Non-Printed or Blank 1"
As Small Minimum Order As 1 Piece ! In Stock - Ship Immediately. Custom Designed or Custom Made Lanyards: Custom Imprinted , Custom Logo Printed , Personalized and Customized Lanyard Series. High quality 6-color silk screen imprinting and multi-color dye-sub for personalized and customized logos are available for custom designed and custom made lanyards. We have in house expert art designers can design a unique artwork for your approval in 20 minutes. Silk Screen Imprinted 3/8", 5/8", 3/4" & 1"
Custom Logo Printed 3/8", 5/8", 3/4" & 1"
Custom Imprinted 3/8", 5/8", 3/4" & 1"
Custom Logo Imprinted. 3/8", 5/8", 3/4" & 1"
Custom Double End and Double Hardware Attachment Lanyards Series. Double Ends, Double Fasteners . 3/8"
Two Fasteners with Two Ends 3/4" &1"
Safety Breakaway Buckles Reflective Color Printed 3/8"
MP3 Straps ,Camera Straps, USB, Fancy, Call, Paintball, Fundraising, Kids and Key lanyards. We are lanyard, badge holder, reel and clip wholesaler, supplier, retailer, reseller, contractor, vendor, distributor, exporter importer and lanyards online shopping wholesale store.